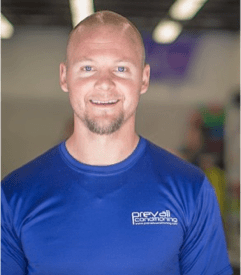 Peter Blumert is the COO and Performance Director of Prevail Conditioning. Peter competed for 2 years on the America’s Cup U.S. Bobsled team. He completed an internship in Strength and Conditioning at the U.S. Olympic Training Center in Colorado Springs, CO. He is a published author for the Journal of Strength and Conditioning. Peter has worked with many athletes ranging from adolescent to Masters, and amateur to Olympic medalists/professionals. He enjoys working with people who have passion, desire, and a will to succeed.